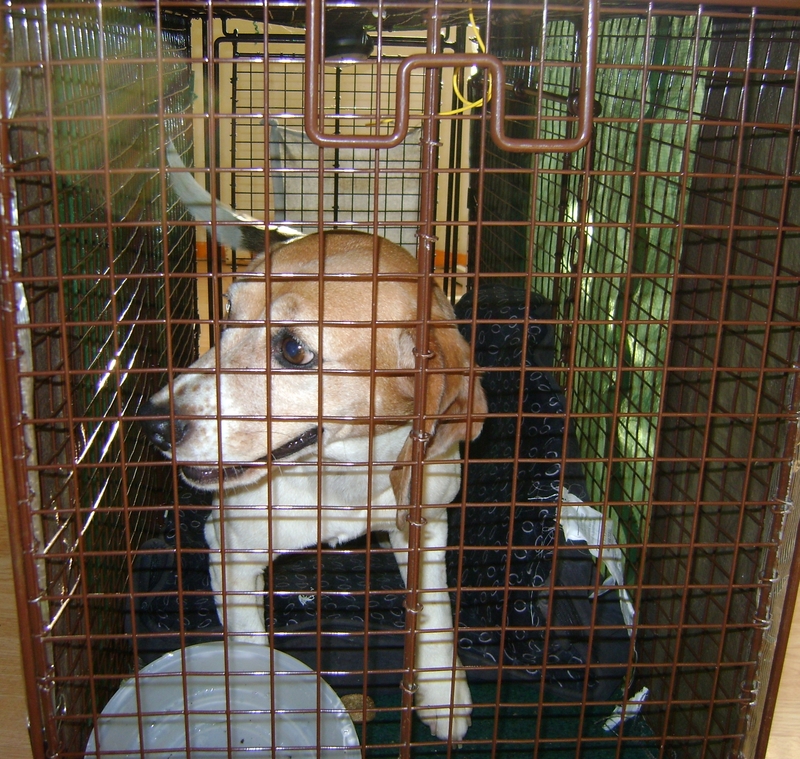 Lindsay, a shy beagle was successfully captured by the well-coordinated team of volunteers at Midwest BREW. Pitfall #1 – Volunteers physically searching for a dog. Most missing rescue dogs are shy. Foot searches are never recommended unless the dog is a very young puppy (barely walking) or has been severely injured, such as being hit by a car. In these situations a “grid search” might be warranted. But this must be well-coordinated with a good plan and strong leadership. Foot searches almost always result in driving the dog further away. He will sense that he is being pursued. If he keeps getting driven out of the flyering area – there will be a lack of sightings and the volunteers will lose the motivation to flyer larger and larger areas. You may also drive the dog into hiding, causing a lack of sightings which also causes frustration and makes volunteers lose hope. Worst of all, your volunteers may pressure the dog and cause him to bolt into traffic and be injured or killed. Pitfall #2 – Using a psychic, animal communicator or douser. These are almost always a scam. Or well-meaning people who think they have a connection with animals but know very little about lost dog behavior. Real psychic sites like AskYourGuide and SeeThroughIt have been warning online communities and teaching how to spot the imposters. They will appear to be “psychic” but they are usually studying google maps and satellite photos to talk about landmarks, even though they live far away. Some may do the first reading for free, but then ask for a credit card number for subsequent “readings”. They advertise on Craigslist and they may contact you offering their services. The readings will be vague. “I see your dog with an older couple.” “I see your dog in a yellow house.” Getting the word out through the use of flyers and signs brings lost dogs home. Psychics can send you in the wrong direction or worst of all tell you that your dog has “passed”. Don’t give up unless you find the remains of the missing dog. He is out there somewhere and perseverance, common sense and logic will bring him home. Pitfall #3 – Tracking dogs. There are some legitimate tracking dog services. They are few and far between. Screen them carefully. What is their success rate at tracking a shy lost dog? If their success rate sounds too good to be true, it is. They are a scam. Remember that good tracking dogs may be able to locate a scent, but lost dogs can move quickly. There are dozens of “pet detectives” that are currently preying on unsuspecting, distraught lost dog owners. They are using Craigslist and Facebook to advertise for free and will tell you that they can find your dog. Remember, you will still have to flyer, establish a feeding routine and trap the dogs. Instead, use your rescue’s valuable resources for flyering, signs and advertising. Pitfall #4 – Giving out exact sighting or trap locations – You will need to communicate with your volunteers, preferably through some sort of closed email or Facebook group. But make sure that they understand that what you share is confidential. You NEVER want to disclose a sighting or trap location publicly – on a Facebook page, in a blog, or to the media. Keep the location confidential because wanna-be heroes, reward seekers, and curious people can derail your plans very fast. Then you will be picking up and starting all over again and you will risk volunteer burnout. Pitfall #5 – Allowing too many volunteers to man a feeding station or trap. Remember, your lost dog is probably very shy and doesn’t trust many people. You need him to relax and feel comfortable coming to a feeding station so that you can eventually trap him. If everytime he goes to the location, there are different scents from different people, he may abandon that location completely and move on. Ideally, the person most bonded with the dog should be the one that is refreshing the feeding station and manning the trap. One or two helpers may need to be involved, but a revolving schedule of volunteers is counter-productive. We hope this series has given you some guidance and ideas if one of your rescue or shelter’s foster or adopted dogs go missing. Searching for a shy lost dog is expensive and time-consuming. Pre-planning, volunteer training and avoiding common pitfalls will save you the time, money and resources that could be better spent on saving more lives.